You see that a democratic government is one that is supposed to be a guardian of citizen rights, right? In the current context, how far the citizens cutting across all class barriers feel about their rights and well-being safeguarded by the elected government? Then, also, how do the citizens come to know about what is the truth at the ground level? It is the media, both print and the TV news channels and of course, the latest social media outlets.For the vast majority of people, it is the popular media, print and TV news channels only. How is the state of media and also the status of media industry today? We are almost at the threshold of the new media culture where freedom of the press, freedom of the speech and freedom of thinking, asking critical questions, ultimately what is the latest buzz, the role of argumentative society. 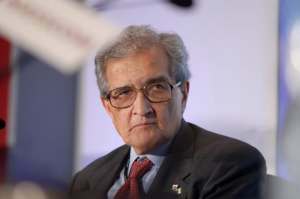 Prof.Amartya Sen is now at the centre of a storm, his words and expressions were ordered to be removed from a biopicture of him. There are also developments. Recently, one respected research journal, namely, the Economic and Political Weekly, founded by a former RBI employee, Sachin Choudhury and later edited by N.Krishnaraj, friend of the Vadamalai Media and right recently by another well-known senior journalist, namely, Paranjoy Guha Thakurta has come for cersorship.This time, the censors are none other than the Trustees of the Sameeksha Trust whos members are some of the past RBI Governors and one Leftwing historian, namely Romila Thapar. Recently, EPW published (?) two articles on a leading corporate house, namely, Adani Power Limited and the trustees asked the editor to “take down the articles with immediate effect”. This had led to protests from some 150 odd academic and public personalities. No explanation from the trustees nor any due procedures either in such swift action! Also, the trustees seem to be acting as owners and even proprietors or investors! It is not clear what really happened. But one thing is sure: the editor is supposed to have his or her freedom to do what he or she had done. Also, the trustees, given their background and eminence are supposed to be acting as role models for others in similar situations. But the trustees don’t seem to have bother themselves either. The protestors, also very eminent names, Martha Nussbaum and one MIT academic, among others. The protestors has pointed out that the free press is for the freedom of intellectual expression and also this is largely an academic journal read by only very specialised audience. The protestors had also drawn attention as to how the corporate takeover of the media industry, both print and TV channels has been going on unrestricted way.So, economic policy making, if it hurts the corporate sector, it, the corporate sector can swing its powerful arm to muzzle the press and there is no one to ask. In recent times the establishment send CBI to raid media houses and the next day news is flashed and credibility is sought damaged. So in recent times two journalists in Karnataka was punished for having caused defamation to legislators. Much more seriously now privacy of individuals is sought to be decided by the 9 member bench of the apex court. Please consider the poor farmers, the most disorganised lower sections of society, whose rights and safeguards, from tenancy rights to right to fair rent are all sought to be muzzled by a set of policies that have brought to the farm to the present almost irretrievable crisis. So, there must be freedom first from fear of the government, democratic or the opposite in practice. Let the ground level realities impart some common sense need for restraining unbridled power of the corporates that fund and also control the ruling dispensations. If that is democracy then god only can save the poor and the weaker sections on the economic spectrum!